Happy New Year! We are excited for a great 2017. This year the WordPress Foundation will continue to pursue our educational mission in a number of ways. First, we plan to contribute financially to other non-profit organizations; we’ll be making major (to us) grants to Hack the Hood, Internet Archive, and Black Girls Code. Second, we’ll be working with local WordPress communities to organize charity hackathons, helping non-profits benefit from open source tools. Finally, we plan to promote education about open source in economically disadvantaged nations. 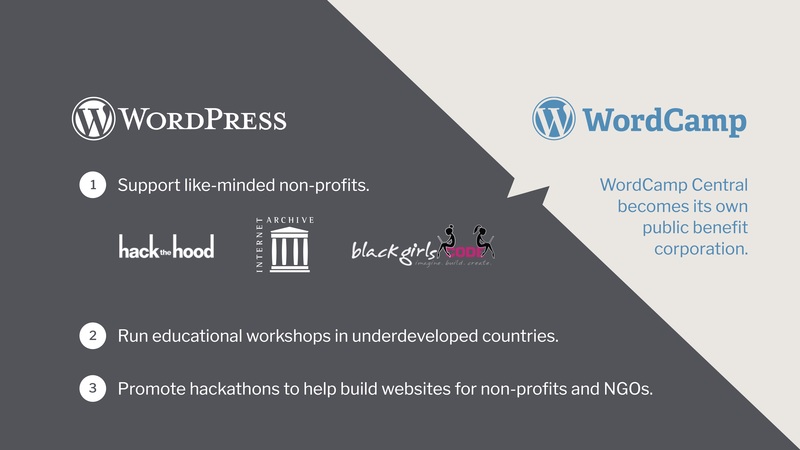 If you’re interested in how you can support the WordPress Foundation in these efforts — maybe you want to organize a charity hackathon in your community or volunteer to teach a free class about open source software — please drop us a line and tell us how you’d like to help. The other major news from 2016 is the creation of the new subsidiary, WordPress Community Support, PBC. This entity will continue to support WordCamps and WordPress user groups across the world hand in hand with the volunteers who dedicate their time. For more news and details, keep an eye on this blog!